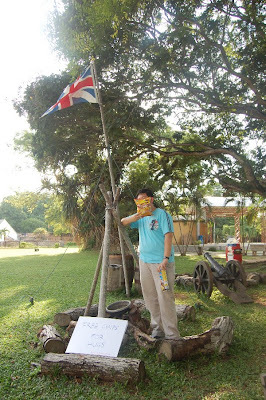 Delta's Dark Den of Destruction: Watch Project Trafford In Action In Fort Cornwallis, Penang! 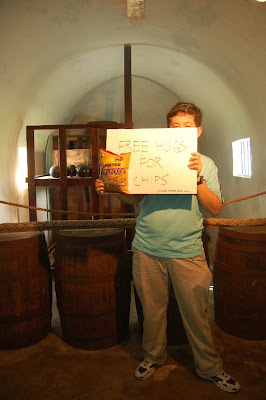 Watch Project Trafford In Action In Fort Cornwallis, Penang! Previous post: Guess Who's In Nuffnang's Project Trafford? A hug can be one of the most comforting things you can give to someone. It can be a sign of friendship or closeness and it just warms up the heart for both the giver and receiver. Two hundred years ago the fort was an important outpost for the British Empire. It was a symbol of the Empire’s military strength and it used to house the Royal Artillery troops and Sikh police. Now it's a very popular tourist attraction. If you compare it to modern day Old Trafford, I guess you can consider it to be Manchester United's very own fort! 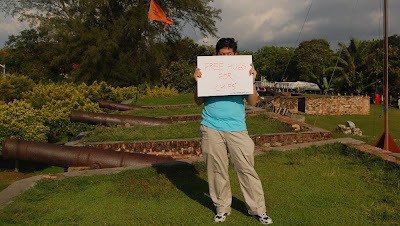 Andy the Project Trafford member and two of his accomplices set out to Fort Cornwallis with some colourful markers and some very large pieces of cardboard. The group then moved onwards into the room where the gunpowder was kept. He stands in front of the antique displays, eagerly waving his cardboard and hoping to catch the attention of visitors. What's this? Noooooooooo! Andy is now locked inside the cell where prisoners were once held. It’s most likely a sabotage by Mister Potato's rivals, but he doesn't give up! Luckily a sympathiser to our cause has released us from the cell! 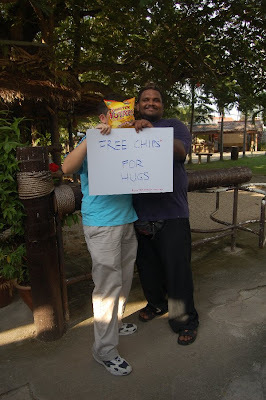 Instead of offering free hugs for chips, we switched our tactics and offered free chips for hugs to lure visitors. See the flag of the United Kingdom? That’s home to Old Trafford as well! Yes! A Mister Potato fan has taken up on our offer! After hugging, we gave him a bag of Mister Potato chips. He may have gotten the chips, but all that matters is we got the pouch! Our teammates are Nicole (leader), Chics, Simon, Aronil and Kif. Together as a team, the six of us executed our game plan in Penang, Kuala Lumpur and even Australia! Split into four groups due to circumstance, we were able to pull off our plan in different and unique ways, and just check out our blog posts to see which method tickles your fancy. wah, so historic. at least you don't have to kiss a guy. patriotic post man :) too bad though it would've been fun trying to execute it with everyone in the group. Manchester United's Old Trafford comparable with the Fort..?? Ok i will not comment :P due to people who love man u and who happen to b from penang. 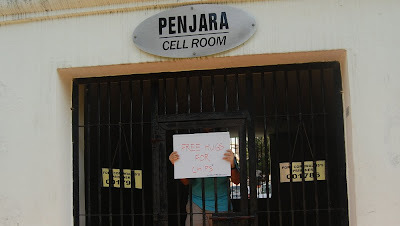 The penjara reminds me of our pudu jail here lol.. haven't been in but i heard pudu is pretty creepy. Simon: Thank you for the sacrifices you have made for the project. We shall honour your deeds for eternity! Yalah, so informative and patriotic. yea man! LOL... should blog about us ma! an air cond in a cell? wt? so fortunate to get air cond hahah lol the prison 'suite'. ANy takers?